In the 7th Century, Songtsen Gampo, the 33rd Yarlung king of Tibet, united the scattered tribes of Tibet and moved his capital from Tsedang to Lhasa. He was one of the first kings to be recognized as an incarnation of Avalokiteshwara, the boddhisattva of compassion. During his reign he had a group of 16 children sent to India to study Sanskrit. Only one child survived the journey and went on to live in India for seven years. His name was Tumi Sambhota. This child later became a prominent Minister in Songtsen’s court and was responsible for standardizing and forming the Tibetan script that is still in use today. He contributed immensely to the translation of the Buddhist Sanskrit scriptures as well, making them understandable to the many devout and faithful followers in the kingdom. 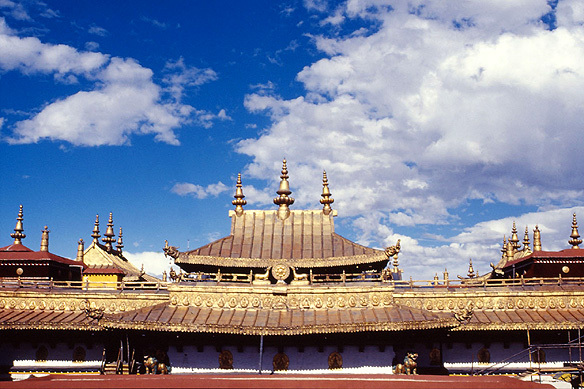 The spiritual center of Tibet, Jokhang Temple is one of the oldest buildings in Lhasa. It was built in 647 AD by Songtsen and his two foreign wives. Every year, the Great Prayer Festival is held in the temple. The rites of Dalai Lamas and Panchen Lamas’ initiation into lamahood are also held here. In front of the temple is a chapel in which 1,000 guttering candles burn continuously. The temple is divided into the inner and outer sanctums. A prayer wheel lined pilgrim route called the Nangkhor (inner pathway) surrounds the quadrangular inner Jokhang, which is itself a sacred collection of chapels, halls, and highly precious statuary on a number of floors, capped with a golden roof. 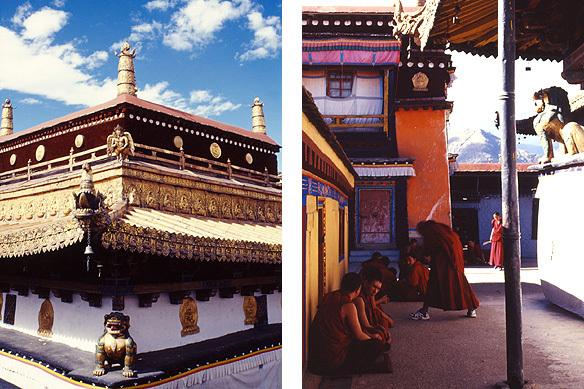 The outer Jokhang is an extension of chapels and halls wrapped around the inner core. Jokhang Temple’s origins date back to the Nepalese Princess Tritsun’s decision to build a temple for the Jowo Sakyamuni aged 12 brought into Tibet by the Chinese Princess Wencheng. 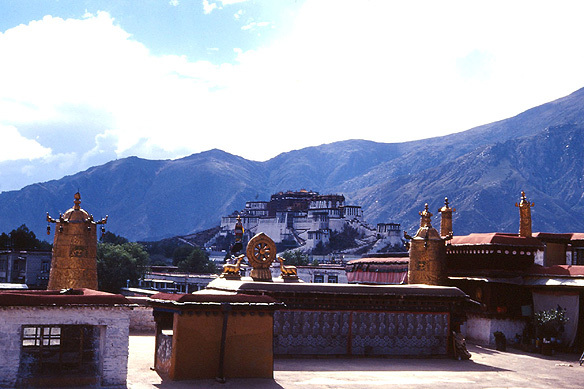 The word Jokhang literally means ‘Buddha’s house’. Princess Wencheng decided on the site of the temple based on Chinese astrology. She contended that the pool in the city was a witch’s heart, and the temple ought to be built on the pool to get rid of the evil. The pool still exists under the temple. Built over a period of 12 months, it was originally a small structure and expanded to today’s scale by later dynasties. The temple is a combination of Han, Tibetan and Nepalese architectural styles and contains numerous precious and sacred cultural relics. The most famous and valuable is the Jowo Sakyamuni aged 12, which is circumambulated by thousands of pilgrims day and night. The effigy is believed to have been made during Buddha’s lifetime by his disciples for his followers and consecrated by Buddha himself. All together, three such were made of Buddha, aged 8, 12 and 25 respectively. Both the effigies aged 8 and 12 are in Tibet. The effigy aged 25 has not been found till date. The statue is flanked by altars of Songtsen Gampo and his two wives. The murals in the main hall are of special artistic value, depicting the procession of Princess Wencheng arriving in Tibet and the building of the Jokhang Temple while other murals tell Jataka stories. The sandalwood pillars go back to the 7th Century, and are said to strike into the evil spirits in the pool under the temple. The chapel of Avalokiteshwara contains the very first statue made in Tibet, whilst another chapel enshrines the seven first monks of Samye. A Tibetan deity often found in Buddhist temples and monasteries, including Jokhang, is that of Tang Dong Jebu, which according to legend lived in his mother’s womb for a hundred years and was born an old white-haired man. He is the patron of music and is worshipped by Tibetans before they move into a new house. A number of interesting customs live on in the Jokhang Temple. As per Tibetan theology, 108 is an extremely sacred number. There are 108 sufferings and this figure is reflected in the 108 beads which comprise Tibetan prayer malas. It is also the number of monks required to maintain and live in the Jokhang Temple. If any monk dies, he is immediately replaced with another. Another interesting custom necessitates the monks, when leaving the hall, to fold their robes on the benches in a way that it would appear in the dim light as if they were still seated. Thus, even when they are busy with any chores, their hearts remain in the hall, in the presence of god. This entry was posted in Exploring our World, Tibet and tagged Avalokiteshwara, Buddhism, Buddhist Monastery, Dalai Lama, Great Prayer Festival, Jokhang Temple, Jowo Sakyamuni, Lhasa, Panchen Lama, Tibet, Tibetan Buddhism, Tibetan Customs, Tibetan Mythology, Tibetan Script, Yarlung Kings by Rama Arya. Bookmark the permalink.